An Ariane 5 rocket blasted off from French Guiana and soared into a deep blue sky Friday, hauling into space a video broadcasting satellite for Intelsat and a high-tech British-owned spacecraft to meet the ever-changing demands of the vibrant European broadband market. The rocket took off from the Guiana Space Center at 1839 GMT (1:39 p.m. EST), disappearing into a cloudless sky a few minutes later on the power of two massive solid-fueled boosters and an efficient hydrogen-burning Vulcain main engine. Nine minutes after liftoff, the Ariane 5's cryogenic upper stage began a nearly 16-minute burn to inject the Intelsat 17 and HYLAS 1 payloads into an elliptical orbit that will take the satellites more than 22,000 miles from Earth. According to Arianespace, the firm managing the rocket's operations, the mission reached an on-target orbit, completing the Ariane 5's fifth successful flight this year. Intelsat 17 separated from the rocket first, then on-board computers jettisoned a dual-payload adapter specially designed for the Ariane's two-at-a-time satellite launches. 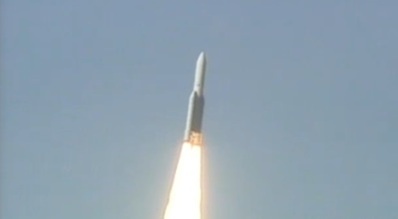 HYLAS 1 was released nearly 35 minutes after liftoff. Both satellites were intentionally left short of their planned operational points in space, and each craft will fire on-board engines to reach a circular 22,300-mile-high orbit over the equator in the coming weeks. 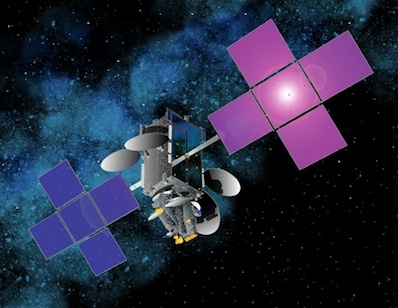 Intelsat 17 is bound for a position in geosynchronous orbit over the Indian Ocean, a prime location to distribute video and other communications services to customers in Europe, Africa, the Middle East and Asia. The 12,214-pound spacecraft C-band and Ku-band transponders will operate for more than 15 years. It was built by Space Systems/Loral of Palo Alto, Calif.
Intelsat says the satellite will provide a range of telecommunications services, joining the Intelsat 10 spacecraft at an adjacent location in geosynchronous orbit. The platform will replace Intelsat 702, an aging satellite launched in 1994. Jean-Luc Froeliger, Intelsat's senior director for space systems acquisition, said ground controllers already established contact with the newly-launched satellite. Four main engine burns are planned to raise Intelsat 17's orbit to geosynchronous altitude, and the spacecraft will be handed over from Loral to Intelsat in January to replace older satellites and establish fresh capacity. "It has a very diversified customer base that includes media customers, government services and corporate networks," Froeliger said in post-launch remarks from Kourou. HYLAS 1 is the product of a unique public-private partnership between the European Space Agency, the U.K. Space Agency, the Indian Space Research Organization and EADS Astrium. The partnership's beneficiary is Avanti Communications of the United Kingdom, an entrepreneurial firm with a mission to link rural European residents through broadband Internet services. HYLAS stands for Highly Adaptable Satellite, denoting the craft's ability to allocate on-board resources to meet spikes and lulls in demand. "It's Europe's first broadband satellite and it will begin to bridge the digital divide, which is a source currently of inequality in our society," said David Williams, CEO of Avanti. The new capability, funded by ESA and engineered by Astrium, will give Avanti "the ability to independently adjust our uplink frequency, our downlink frequency, our bandwidth and our power," said J. Cooke, the HYLAS 1 satellite mission director from Avanti Communications. ESA initially provided $45 million to jump start the development of HYLAS 1's generic flexible payload. The funding came through ESA's Advanced Research in Telecommunications, or ARTES, program. The agency has two more public-private projects in the pipeline for launch in the next few years, including partnerships with Hispasat for a small communications satellite and Inmarsat for Europe's next-generation Alphasat platform. "ESA is providing a brand new technology and Avanti is using that brand new technology to deliver services to Europe," said Jean-Jacques Dordain, ESA's director general. The institutional budget from ESA and the British government convinced private investors to contribute more than $500 million to Avanti, according to Williams. "Space is an industry with great barriers to entry, so it's some surprise that Avanti managed to get here," Williams said. Avanti officials say HYLAS 1's Ka-band and Ku-band payload will serve between 150,000 and 300,000 users in Europe from a position at 33.5 degrees west longitude. 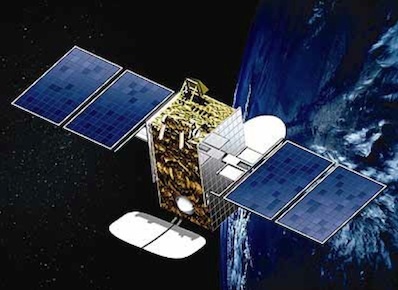 The 5,666-pound satellite was built by Antrix, a subsidiary of the Indian space agency, and should last more than 15 years. HYLAS 1 was originally contracted to fly on a SpaceX Falcon 9 rocket, but Avanti switched to Arianespace in 2009 to allay investors' concerns about launch risks. Arianespace assigned HYLAS 1 to launch on the first Soyuz rocket flight from French Guiana, but launch pad development delays forced another rocket change to the workhorse Ariane 5 to ensure liftoff by the end of 2010. "Avanti has tonight grown up a little and joined the European space family, and that's a family which I'm very proud to be a part of," Williams said. Arianespace plans to end the year with a sixth Ariane 5 launch Dec. 21 to deliver to space the Hispasat 1E and Koreasat 6 satellites for Spanish and Korean operators.